See checklist of differences between O. lindheimeri and O. engelmannii. Also see O. lindheimeri subaramata. Opuntia lindheimeri is a large, widespread prickly pear cactus extending from eastern-central Texas to the Pecos River in West Texas. In the south it is found all the way to the Rio Grand River and into Mexico. In the north it extends into Oklahoma. This prickly pear forms large sprawling shrubs 0.5-1.2(3) m tall, with obovate or orbiculate cladodes 15-27(30) cm × 12-22(30) cm wide and 1.5-2 cm thick. There are (0)1-5(8) clear yellow spines per areole with reddish brown bases. Largest spines are (3)4-6(7.5) cm long. Typically the spines are not arranged in a bird’s foot pattern as in O. engelmannii, and there are often one or more spines that are porrect or deflexed (see checklist of differences between O. lindheimeri and O. engelmannii). Seedlings are hairy. Flowers are brilliant yellow, but they turn orange or reddish over time. However, in South Texas flowers may have shades of orange. The flowers are 5-8 cm long and 5-7.5(10) cm across. Filaments (1.5 cm long) and anthers are cream-colored. The style is greenish-yellow to white or cream, 1.7 to 2 cm long with a bulbous base. The stigma is typically dark green. The pericarpel is 4-6 cm long and 2-2.5 cm wide. Fruits are purple to reddish-purple, often pyriform, 3-7 cm long, 2.5-3(4) cm in diameter, spineless, and with a shallow umbilicus. The fruit pulp and juice are beet-red and very juicy. The fruit is reported to be sweet, but not always so in our experience. Seeds are tan, irregularly discoid and small, 3-4 mm in diameter by 1 mm thick, with a narrow aril. Britton and Rose also considered that O. lindheimeri is a stand-alone species. The point is not settled, and other botanists accept O. lindheimeri as a variety of O. engelmannii. Both have yellow flowers with green stigmas. Whatever their taxonomic relationship, the plants are easily distinguished when grown side-by-side and do not generally overlap in their natural ranges. O. lindheimeri is a plant of deeper soils and more mesic conditions (central and eastern TX), whereas O. engelmannii is a true desert plant of rocky or shallow soils (western TX and the western deserts). O. lindheimeri occurs west of the Pecos River, but it is uncommon. We accept O. lindheimeri linguiformis (‘Cow’s Tongue’ cactus) as a garden form of O. lindheimeri and not a variety. 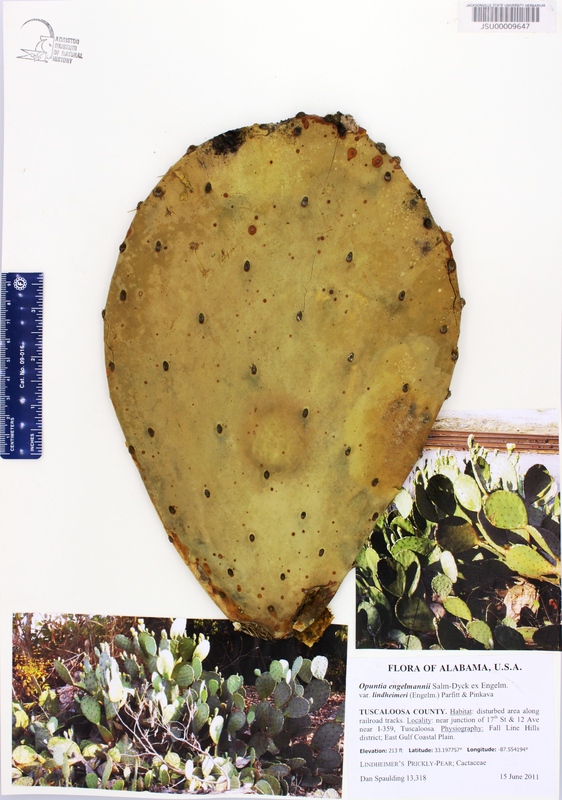 Powell and Weedin, (2004) also described ‘Cow’s Tongue’ cactus as a cultivar (‘linguiformis’), but placed it in O. engelmannii. The relatedness O. lindheimeri with O. engelmannii is clear. Powell and Weedin report an assemblage of names that may were applied to O. lindheimeri at one time or another. Almost any large Opuntia in TX, NM, or AZ has probably been misidentified or misunderstood over the years, and O. lindheimeri is no exception. See the original description. Like O. engelmannii, O. lindheimeri is hexaploid.